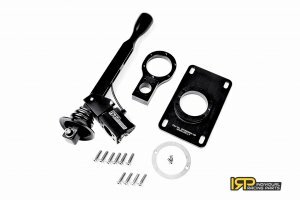 IRP Racing Shifter (Individual Racing Products) is finally here in the USA! These shifters are the top line racing quality for the Genesis Coupe Manual transmissions 2010-2016. This design is a direct drive system that removes all your factory linkage and bushings. By doing this design, you get a sharp, crisp shifting feel that allows extremely fast shifting on the track. We personally tested these on our race cars are gave it five stars for performance! Well worth it's value. The side set screws allows for adjustment on left and right throw. Even better, the unit has a built in reverse lock out button that allows reverse only to be used when the driver pushes the button on top of the shifter. This makes for less mistakes when quickly going into first gear.